Since the early days of windsurfing and later with the very trendy Kite-sport, riding with a Surf-Harness has become the standard, riding without it unthinkable. Nowadays, the harness is a well-integrated piece of equipment in water sports, in fact 1,5 million Kiters love riding with their harness today. Whereas, Pro-kiters demonstrate improved performance and endurance, the average water sport enthusiast can more easily participate and enjoy the sport because of the comfort acquired from getting towed “hooked in” to a harness. Lowering the entry hurdle by wearing this harness should encourage "new people” to consider these sports as a recreational activity and stop others from abandoning these sports. However, the advantages are not limited to riding with less fatigue - the pull at the harness comes much closer to the body’s centre of gravity which improves the rider’s posture and control significantly. It lets you focus much more on riding the board or ski, as you feel fewer impairments coming from hard pulls at the handle. Actually, holding onto the handle is just a means to getting towed but it is not the main objective of the sport. Lessening the pull at the handle is a very welcome advantage which clearly simplifies and changes the game. I have observed the latest trends in and efforts made by the waterski industry aiming to make water sports more attractive and user friendly for the average family. 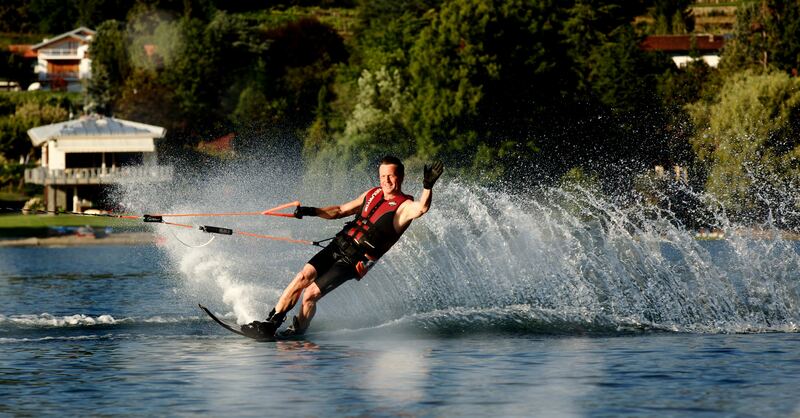 This is exactly our credo, waterskiing and wake-boarding should be fun for everybody. Our WAKEBAR fulfils these expectations and could be a catalyst for further growth of towed water sports with a lot of cross-selling opportunities.